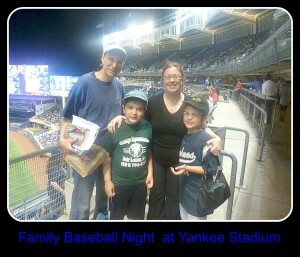 Earlier this week, my family and I went to the Yankees game. It was our first time at ‘new’ Yankee stadium. For SJ the game was more momentous: it was SJ’s first professional baseball game. He was more interested in getting a hot dog than the actual baseball game. BR, Ms. MMK and I were more interested in the actual game. We wanted to see Derek Jeter one last time. The certain Hall of Famer is retiring this year. 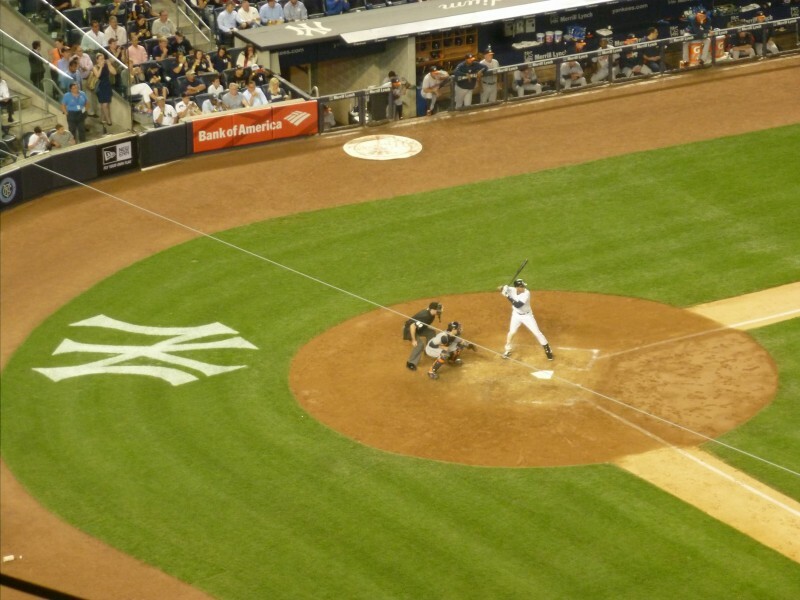 I wanted BR, a baseball fanatic, to be able to say he saw the great Yankee, Derek Jeter, play. 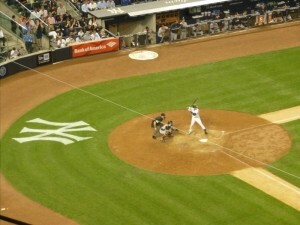 Derek Jeter at the plate. We wanted to do something as a family. Soon, the school year will start and schedules get hectic. It’s generally Sunday or bust. Between and during the middle of innings, fans’ attention at the baseball game was called to the big screen that sits high above center field. Such a screen was once a novelty. Simply having the screen was cool, and it was not perpetually on. Well, times have changed. One must be constantly entertained during their stadium experience. I’m not going to complain about how I miss the quiet moments at a baseball game when you could have a conversation or simply stare out at the field lost in a daydream. Nope, I’ll keep that complaint to myself. Anyway, the big screen focused on one thing primarily, and it wasn’t baseball. No, it was the fans. That might sound silly. After all, are the fans there to see each other or a baseball game? However, the producer who decided the focus should be on the fans clearly made the right decision. Every time a fan noticed him or herself on the big screen, they went crazy. Every single fan. They danced like maniacs, smiled wider than the Pacific, or made a silly face as if auditioning to be a clown. It’s all clean fun, and everyone seems happy when they get their moment on the big screen. But why? Why are people so damn excited if they are on the big screen? Seriously, are they that desperate for attention? Do they want the other 40,000 plus people to notice them? They appear for 10 seconds on the screen –max – and then the screen focuses on somebody else. Maybe the fans hope their antics will cause a sensation. They’ll go viral. “Hey did you see that person at the baseball game who did xyz?” Next thing you know there is 4 million hits on Youtube. And then the fan gets interviewed by Letterman or Fallon or Stewart or Kimmel. Or all of them. Then, the fan get his or her own reality television series. They appear on the tabloids. Discussion of their dating partners, marriages, divorces, childrens’ births, weight gains and losses, arguments, tears, and what they really think of the ice bucket challenge will be top news. Maybe, that’s what the fans want. Or maybe not. Anyway, let the people enjoy their moment on the screen. Let them share it on Facebook with their friends. But I don’t want to be on the big screen. No thanks. At the baseball game, I’d rather eat my popcorn, talk to my children, and maybe even smile at those who are willing to go crazy for the camera. I don’t need you to look at me. Instead, I’ll just have a blog where I share personal things. Hey, wait a minute. P.S. Anyone know if you can get free tickets for the on screen antics? Hey, look at me, look at me, look at me. This entry was posted in Family, News, Sports and tagged baseball game, big screen, family, fans, ice bucket challenge, yankees by lardavbern. Bookmark the permalink. Yeah, sure that’s the reason. I would rather die a thousand deaths than be caught on a stadium camera. Good grief, just the thought of it is upsetting! And blogging is hardly the same thing. Or is it? I see similarities because in a way aren’t we looking for attention as well? That sounds like a fantastic family outing. We considered going to a Jays game with travel costs, tickets, parking, food, etc. it was going to cost around $500. I’d rather spend $500 in gas and go out East to visit my family in Nova Scotia. It was fun. We got cheap (relatively) tickets on E-bay. I’d say the whole thing – tickets, snacks, parking, etc. cost about $140 bucks. It’s not cheap but it’s the only game we went to all year. That’s a great day out for $140!! Maybe next year I’ll bite the bullet and spend the money. Of course, Rian will be 17 and Alexi with be 15 by then. They may not want to spend the day with Mom. Maybe a cool event like that will make it worthwhile to hang out with mom. Fun family time–on screen or off.